When twelve-year-old Izzy discovers a beat-up baseball marked with the words "Because…magic" while unpacking in yet another new apartment, she is determined to figure out what it means. What secrets does this old ball have to tell? Her mom certainly isn't sharing any—especially when it comes to Izzy's father, who died before Izzy was born. But when she spends the summer in her Nana's remote New Mexico village, Izzy discovers long-buried secrets that come alive in an enchanted landscape of watermelon mountains, whispering winds, and tortilla suns. 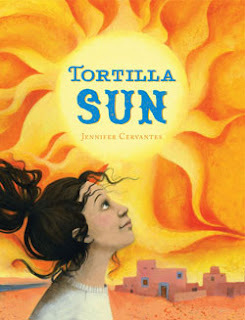 Infused with the flavor of the southwest and sprinkled with just a pinch of magic, this heartfelt middle grade debut is as rich and satisfying as Nana's homemade enchiladas. Jennifer Cervantes lives with her husband and three daughters in Las Cruces, New Mexico, where she enjoys sunsets, tortillas, and chiles fresh from the family farm. Tortilla Sun is her first novel for children, and she is currently working on her second.